One of the most powerful and result-yielding habits of successful people is that successful people are extremely consistent with what they do in life. They are doing the work every single day, day in and day out, and this is what makes them the master in what they do. They become good and they improve their skills through consistency. When I’m in writing mode for a novel, I get up at four a.m. and work for five to six hours. In the afternoon, I run for ten kilometers or swim for fifteen hundred meters (or do both), then I read a bit and listen to some music. I go to bed at nine p.m. I keep to this routine every day without variation. The repetition itself becomes the important thing; it’s a form of mesmerism. I mesmerize myself to reach a deeper state of mind. But to hold to such repetition for so long—six months to a year—requires a good amount of mental and physical strength. In that sense, writing a long novel is like survival training. Physical strength is as necessary as artistic sensitivity. You can read the full interview with him here. As you can see, Haruki devoted his success to his consistent routine. Success is not an overnight thing and you can never produce an amazing result within days. It takes sustained and consistent effort to make it big. Success is a numbers game after all. The more action you take, the more likely the opportunity will come to you. If you look at all the successful people out there, you will notice that they did not make it in a short period of time. They all make it through consistent hard work. It takes years of consistent effort before they finally achieve the result they want. In fact, consistency beats hard work. Working hard alone is not enough. Imagine if you wanted to lose weight and you work hard in the gym for 10 hours straight. But then, you just do it for one day, do you think you will get the result? Not likely. It is better to workout in the gym for an hour a day for ten straight days rather than do it for 10 hours straight in a session. Most people get it wrong and mistaken being successful is all about hard work. No, it is not, it is only partially true. Hard work is important, but what is even more important is your consistency in making progress and doing the work. Therefore, if you want to produce a great result in life, you must be consistent with your dreams, your goals, and your actions. So how can you do that? The answer is simple, just apply the Rule of Five. I first came across this idea from Jack Canfield, through one of his life-changing books, The Success Principles. Jack Canfield was known as the author of Chicken Soup for The Soul. Together with his partner, Mark Victor Hansen, they went on to sell the book series more than 110 million copies in the US and Canada. And across the globe, the Chicken Soup series books have sold more than 500 million copies and been translated into 43 languages. Time magazine even called it “the publishing phenomenon of the decade”. However, Jack said it in his book, that the huge success of the book was not a publishing phenomenon, but rather, a phenomenon of persistence effort in applying the Rule of Five. When Jack and Mark started with the Chicken Soup book, they both wanted to make it big and make it into a best-seller. They asked many other successful authors such as John Gray, Barbara DeAngelis and even Ken Blanchard for advice. They even bought and read John Kremer’s 1001 Ways To Market Your Book. Guess what, they felt overwhelmed and became a little confused and have no idea where to start. And so, they developed an idea called The Rule of 5. What they both needed to do each day was to take 5 specific actions that will lead them to their goals. They can send 5 review copies to editors who are keen; they can call 5 network marketing companies and ask them to buy their books as a motivational tool for their salespeople; they can give a seminar to at least 5 people and sell the book; and on someday, they can just send 5 copies of the book to celebrities like Harrison Ford, Steven Spielberg, and Sidney Poitier; and they did all of that. They made phone calls to people who could review the book; they wrote press releases; they called talk shows and give away their books for free, some of the shows were at 3am; they gave talks using stories from the book in churches; they even got gas station, restaurant, and bakeries to sell the book; all in all, they did a lot of things and put in a lot of consistent effort. Eventually, the book went on to sell millions of copies. However, it did not happen overnight. The book hit the best-seller list after a year. This was how Jack and Mark leveraged on the Rule of 5 over a sustained period of time to achieve a phenomenal result. If they can do it, guess what, you and I can do it as well. What we needed to do is to take 5 action steps each day to complete tasks that will lead us to our goals. Well, the second time I heard about this principle was from Robin Sharma, the author of the best-selling book, The Monk Who Sold His Ferrari and The Leader Who Had No Title. Robin Sharma said that if you will just take 5 action steps each day, within a year, you will have accomplished 1825 victories that will totally change your life. Can you imagine how your life will change if you accomplish 1825 tasks? And it gives me the insight that I can do anything, by just taking small and consistent action. Yes, you can achieve anything you want; all you need to do is to take small steps every day. Every big success was first accomplished through small successes. It is your small decision that you make every day that will lead you toward the big success you want in the future. It is what you do right now that truly counts. Even though what you do right now may seem small, but when the small effort accumulates, they can become mountains. Clear direction – when you write down the five things you need to do every day, you know what you do and you will never lose. Never feel overwhelmed again – do you ever feel like there’s a ton of things to do and you have no idea where to start? Or you probably feel paralyze because you feel overwhelmed with works? You will never have this problem when you apply this rule to your life. Boost your confidence – once you got your small tasks accomplished, you will feel satisfied and you will feel more confident because you know you are on your way to something big. Saves you time – when you get to your office or when you start your day, you know what are the five tasks you need to do and you can dive straight into your tasks. Easy to apply – yes, the Rule of Five is easy to apply. Anyone can do it. Write down the 5 small action steps you need to get done every day, and then take action upon them. 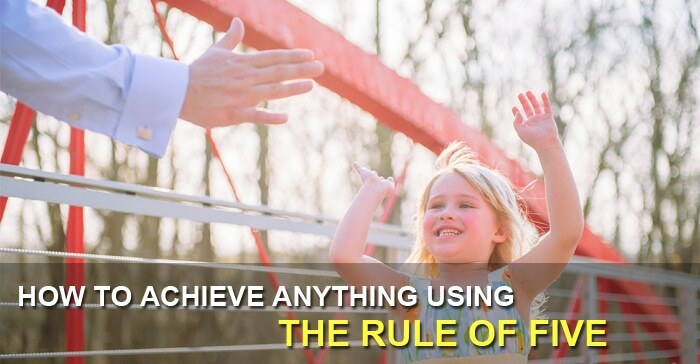 You have now learned that there are plenty of benefits and advantages of using the Rule of Five. All you need to do is to just apply this rule into your life starting right now. 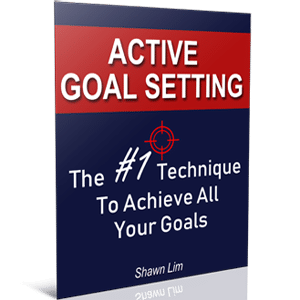 Congratulations, you have just learned a simple, yet powerful technique to achieving your big goals and dreams. When the goals you want to achieve are too big, they may seem impossible to achieve. However, if you apply this rule, things will become easier. Whatever you do, just make sure you take five action steps that will move you closer toward your goals and dreams each day. And you will eventually get what you want.